The party last night was great, but this morning you're feeling it and paying the price. Your hangover is in full swing and all you want is a little relief. What is the best hangover cure? In reality, there is no magic solution to your problem. Many of those "hangover cures" you can pick up at the convenience store are virtually worthless, so you might want to save your money. Some other hangover supplements may help you find relief, but it's important to do your research to ensure they're safe for you to use. When you're hungover, your body is feeling the effects of alcohol. The nausea, weakness, and headache you're feeling will only go away if you try to counteract them in the most practical and healthiest ways. That includes rest to let your system recover, water to rehydrate your body, and some way to replenish the essential vitamins you lost overnight. While there were steps you could have taken last night to try and prevent this morning's pain, it's too late for that. You'll have to try those tricks next time. For now, there are a few things you can do to help relieve the pain and get back on your feet. Unfortunately, there is no one-size-fits-all hangover cure because everyone's body is different. You will have to find what works best for you and it will likely be a combination of things. Let's take a look at a few tried and true hangover cures that you can try. There are no gimmicks here, and you likely have everything you need. Rest is your best friend at this point because your body needs an opportunity to recover. It is best to simply stay in bed as long as you can. Even an extra hour or two of sleep will help out tremendously. Water is the first thing you should be drinking this morning. The alcohol you drank last night dehydrated your body and the best way to feel better is to rehydrate it. Have a glass right when you wake up and continue pouring yourself a fresh one over the next few hours. Just be sure not to overdo it because slamming too much water can make you feel worse. Go slow, but keep the water flowing. You can also replenish your body with fruit or vegetable juices. Alternating one of these with water is one of the best things you can do for a hangover. The water rehydrates while the juice gives you necessary vitamins. Tip: For a quick pick-me-up, add a little lemon juice to a cup of warm water. Add ginger if you have it to help with nausea. This is one of the easiest and most effective restorative drinks you can make. What about sports drinks? While some people swear by Gatorade and other sports drinks for a hangover, there's no evidence that these actually work better than water or juice. If you have some in the refrigerator, it can be an alternative to juice, but don't rely on it. A weak cup of coffee may be okay, but an entire pot will only dehydrate you more and it may make your headache worse. This is the opposite of what you want right now. Even though it is tempting to grab a cup to wake up, it is not the best idea. Alternatively, you could make a cup of sweetened tea. The sugar and caffeine will give you a little boost without dehydrating you too much. Most teas have less caffeine than coffee and the type of tea and the brewing method can reduce the amount of caffeine. Don't let your tea water boil, but gently warm it or brew a decaf tea. These are not actually caffeine-free but they do have much lower amounts. You can also try a naturally caffeine-free rooibos tea, which is high in antioxidants, and add some detoxifying herbs and spices. If you insist on caffeine this morning, drink one glass of water for every caffeinated beverage. This will help counteract the dehydration side effects. Your body could really use some vitamins right now. The easiest way is to drink orange juice for a healthy dose of Vitamin C. If you have a multivitamin in the house, now is also a good time to take that as well. Food may seem like the last thing you want right now, but it can help and it doesn't have to be much or anything that will make you sick. Eat mineral- and protein-rich food, even if you don't feel like it. Begin with something bland, like a piece of bread, a few crackers or pretzels, or a banana. If that stays down, try something with a little more substance like a piece of fruit. Your mother gave you chicken noodle soup when you were sick as a kid, right? Try that now. It is packed with protein and minerals and you can always just slurp the soothing broth. If you're up for it, take a few minutes to whip up a hangover-friendly breakfast. Some people swear by fast food when they're hungover. You may want to drag yourself down the street for a greasy burger and fries if you can stomach the thought. When even standing seems like a challenge, it takes willpower to get up and move. However, there is some truth to the benefits of a little exercise. It is not a magic cure, but it can help restore your body and mind. It can also increase your metabolism, ridding your body of the toxins a little faster. There's no need to work up a sweat, either. A short walk in the fresh air can really do wonders. If your hangover is at the level where even that is not a good idea, take a few minutes to just sit outside and breathe. A little sunshine and a light breeze have wonderful restorative powers. Your head is pounding and it's tempting to reach for a quick pain reliever. This is not the best idea when you're dealing with a hangover. Over-the-counter (OTC) products like aspirin, Tylenol, and ibuprofen have side effects that are magnified while alcohol is in your system. This is probably contrary to everything you want to do right now, but for your long-term health, it is good advice. Just like alcohol, aspirin is a blood thinner and the two in combination can intensify the effects. Tylenol (or acetaminophen) can cause more damage to your liver and ibuprofen can cause stomach bleeding. If you absolutely feel the need to take one of these, make sure it's a very low dose. Avoid acetaminophen altogether. There are alternatives, though! One of the best natural pain relievers available is Tiger Balm. It is available in many drug stores and that tiny, unassuming jar can really knock out a headache. Simply rub it into your temples and you should feel some relief soon. Once you have slept as much as possible, take a cool shower. This will not only clean you up but freshen and wake up your senses as well. Some people like to switch between cold and hot water in the shower and that's not a bad idea. Don't take this to an extreme as the shock could do even more damage to your system. 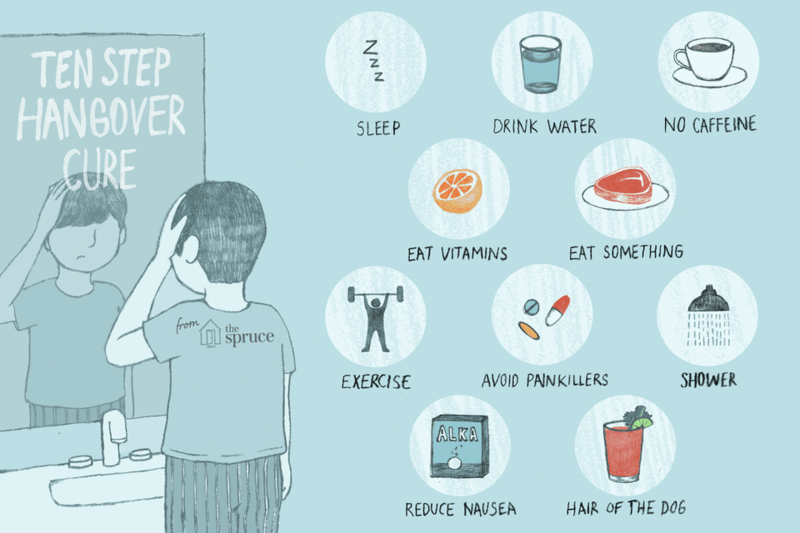 What can you do for that hangover-induced nausea? Try Alka-Seltzer or a similar effervescent tablet in a glass of water. If you don't have that in the house, stir 1/4 teaspoon of baking soda into 4 ounces of water and drink it (a splash of lemon juice helps to get it down). Another great way to ease an upset stomach is to have a drink that includes ginger. A warm cup of ginger tea is one of your better options. You might even find some relief from sipping a glass of ginger ale. Alternatively, try ginger lozenges, extracts, or tinctures; some of these can be found at the drug store. In Poland, drinking pickle juice is a popular remedy. It is one of the common Eastern European hangover foods that many people swear by. Great things have been said about the "magical" street food of Poland after a night of drinking. There is some merit to it considering that it comes from a vodka-loving culture. While the popular phrase “hair of the dog that bit you” may sound logical when a shot of whiskey is still in the bottle next to your bed, it will only provide temporary relief. Using alcohol to cure the pains created by alcohol is not the best idea because it will only prolong your recovery. Yet, if you're tempted to do so, play it smart. Try a bloody Mary instead of a shot of liquor. While your blood is dealing with the new alcohol it is ignoring the old. In the meantime, the tomato juice and other ingredients are replenishing your body with vitamins. If you drank the last of the vodka last night, make a virgin Mary, the tequila-based bloody Maria, or go with the original bloody Mary base of gin. Any of them will do the trick. If you're lacking those ingredients or just want a simple, spicy morning-after drink try the hair of the dog. The recipe is nothing more than gin, lemon juice, and hot sauce, so it's easy and sure to bite your hangover back. The popular michelada works the same way, but with beer. Now, if you'd like to go old-school, you could always mix up a corpse reviver. As the name implies, these classic drinks have long been used to wake those who had a little too much to drink. Yet, they do require more work than you're probably up for right now, so one of the pour-and-drink options might be a better choice. This treating alcohol with alcohol approach is not a great idea, but if you do it, make sure to keep it low-key. Stick with one well thought out drink and try not to start your binge all over again. It will only make things worse when you do sober up, which you will have to do eventually. According to Irish folklore, it was said that the cure for a hangover was to bury the ailing person up to the neck in moist river sand. This is obviously not a recommended hangover cure, but it is a fun bit of trivia that may put a smile on your face this morning. And, with that, it's time for you to head to the kitchen for a glass of water then wander back to bed. How Many Shots Are in That Bottle of Liquor?